The Doppler method, or the radial velocity (RV) method, was the first method used to detect planets around solar-type stars: just as a star gravitationally tugs an orbiting planet, the planet tugs the host star, causing the star to move in its own tiny orbit. This ‘wobble’ motion of the star can then be detected as tiny Doppler shifts in the star’s spectra. Over the last two decades we have found around 500 planets with this method, and to this day it remains the most direct way to measure exoplanet masses. However, the RV method has its limitations. One of them is stellar activity. Stars are not perfectly stable, smooth objects. Instead, stars are active: they move, oscillate, flare, and rotate. Any features present on the stellar surface, like granules, starspots, or faculae, dance around the surface of the star, fading in and out of view (see video of evolving sunspots below). This variability—or ‘stellar activity’—can induce unwanted signals in the stellar spectra we observe. Annoyingly, it just so happens that these signals can have similar frequencies and amplitudes to planet signals. This is a problem. We might mistake periodic stellar oscillations for planets. Meet stellar activity: The Problem. How do we differentiate between stellar activity and planets? Good question. Excellent question. This is the question the authors of today’s paper seek to answer. More specifically, the authors ask: How do we tell the difference between planet signals and stellar activity using only RVs? The authors note that other groups have used both RVs and photometric data to successfully disentangle planet signals from stellar activity. However, such an approach requires a joint model for photometric and RV variations. And what do we do when we only have RV data? The authors therefore set out to create a general framework to model stellar activity using only RVs, using few assumptions about their dataset, while confidently recovering planets if any are present. In the paper, the authors describe their modeling procedure in detail. In short, the authors use a Bayesian Markov Chain Monte Carlo (MCMC) model. This essentially means that they have a model that takes in data and any prior knowledge the authors have about it. The model then tells them how well the different model parameters describe the data, after calculating a multitude of candidate solutions. In the authors’ application, they do not know the final number of planets (they are trying to find it! ), so their model varies the number of planets, while fitting for two main signals in the RV data: planet signals, and stellar activity signals. Let’s take a closer look at how the authors model these signals. First, the planet signals. The planet signals are relatively easy: they cause the whole spectrum of the star to shift, causing a clean Doppler shift, which is relatively easy to measure. The planet orbits can be described with Kepler’s laws. 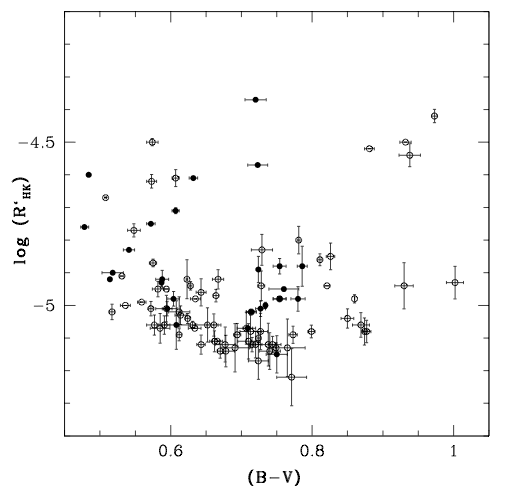 Stellar activity signals are harder to describe. Stellar activity can be periodic, or quasi-periodic, and generally acts on a part of the spectrum at a time. The overall behavior of stellar activity can be modeled as correlated noise. To model stellar activity, the authors use Gaussian Processes. Gaussian processes are a flexible tool in the astronomer’s statistical toolbox—important as they inherit properties from the normal distribution—and an efficient way to model correlated noise. The authors apply their method to HARPS observations of the active star CoRoT-7, confidentially detecting two planets. Figure 1 shows one of the main outputs from their simulation: the posterior distribution of the number of planets, which we can be used to infer how many planets are supported by the data, and to gain information about their orbital parameters, and in particular, their masses. What do the authors mean by ‘confidently’ detecting two planets? 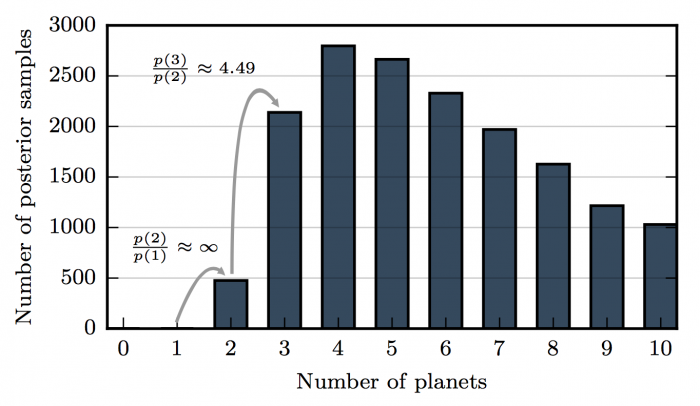 The authors use a strict detection criterion, stating that to claim a detection of N planets, then the probability of N planets should be at least 150 times greater than the probability of N-1 planets. This approach regards false positives (saying there is a planet, when there really isn’t one) to be worse than false negatives (saying there isn’t a planet, when there really is one). This is highlighted in Figure 1, showing that according to this criterion that there is strong evidence for two planets, while the evidence for more planets is relatively weak. Figure 1. The posterior distribution for the number of planets around CoRoT-7. The ratios of the probabilities between models with 1, 2, and 3 planets is highlighted (note that p(0) = p(1) = 0). 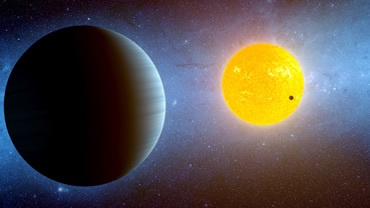 According to the authors’ detection criterion, the evidence for two planets is much stronger than the evidence for three or more. The planets around CoRoT-7 (CoRoT-7a, and CoRoT-7b) had been announced previously in earlier papers, but the high activity level of CoRoT-7 created a lot of discussion with different planet mass estimates being reported. Another group combined RV data from HARPS with simultaneous photometric measurements, to successfully disentangle the stellar activity signal. The authors of today’s paper achieve similar results, now using only RVs, showing that RVs are rich in information content. The importance of this work is not the specific application to CoRoT-7, but rather that the authors have provided a fast framework to facilitate the study of planets around active stars using only RVs. In the future, the authors plan to test their framework further, to see how well it performs on other RV datasets. The authors have all their code and data used presented in this paper available online on GitHub: https://github.com/j-faria/exoBD-CoRoT7. Take a peek, help them improve it, and by all means use it to find more planets! I am a second year Ph.D. student in Astrophysics at Pennsylvania State University, where I work with Dr. Suvrath Mahadevan on building and testing various subsystems for the Habitable Zone Planet Finder (HPF) spectrograph. I did my B.Sc. in Physics at University of Iceland where I fabricated integrated optical devices with applications in biosensing in a nano-fabrication lab. When I'm not building instruments or writing for Astrobites, I try to get better at (timelapse) photography and MMA. Hi, can you please give the reference for the work that you are talking about when you mentioned ‘Another group combined RV data from HARPS with simultaneous photometric measurements, to successfully disentangle the stellar activity signal.’ ?